The ancient Greek philosophers believed that the Sun, Moon, planets, and stars were mathematically perfect orbs, made from unearthly materials. These bodies were believed to move on perfectly symmetric celestial spheres, through which a backdrop of fixed stars could be seen, rotating majestically every 24 hours. At the centre was the motionless Earth. For the Greeks, the power of reason was more important than observation. Some 2000 years later, this was the prevailing cosmology when the telescope appeared on the stage. A simple spyglass, consisting of two lenses held in sliding tubes, emerged from the European eyeglass lens-making industry, sometime in the 16th century. Initially the instrument had limited capability but, in the hands of one genius, Galileo Galilei, it soon began to deliver breath-taking views of the cosmos, imperfections of the heavenly bodies, and crucial evidence supporting Nicolaus Copernicus’ earlier model of a heliocentric system, placing the Sun at the centre of a whirling velodrome of planets. Technology and curiosity were then harnessed, elevating the telescope to higher degrees of size, power, and perfection to create scientific instruments that would come to revolutionize our understanding of the Universe. Cameras and spectrographs were attached to record what could not be seen by eye and to split starlight into its rainbow colours. Stellar spectra reveal the chemistry of the stars, their temperatures, their rotations, and their motions. Crucially it showed that stars were made out of the same types of atoms that are found on Earth, heralding the birth of astrophysics. Just over 100 years ago, we believed that our star, the Sun, lay in a cluster of stars, which defined the observable Universe. But when astronomers like Edwin Hubble pointed big telescopes to look out beyond our Galaxy, the Milky Way, they found a seemingly endless ocean of space and time, with billions of other galaxies embedded in it, all rushing apart from us and from each other. The Hubble expansion showed that the Universe is highly dynamic and that it started with a Big Bang, 13.8 billion years ago. Traces of a faint cosmic microwave background radiation, the ubiquitous relic of the Big Bang, were discovered in the 1960s. Other radio telescopes discovered exotic objects like pulsars and the high-energy processes taking place in the hearts of galaxies, where supermassive black holes gobble up matter. Freed from the blurring and blocking effects of the Earth’s atmosphere, space telescopes, like the Hubble Space Telescope, and others at g-ray, X-ray, ultraviolet, and infrared wavelengths began observing high-energy processes and the formation of stars and planetary systems in giant clouds of cold interstellar gas. One of theses, a young star called HL Tauri, 400 light years away, was recently caught in the act of giving birth to a new planetary system by the Atacama Large Millimetre Array (ALMA) telescope in the Chilean desert. In this image, the newly born sun is seen to lie clearly in the middle of its nascent planetary system. 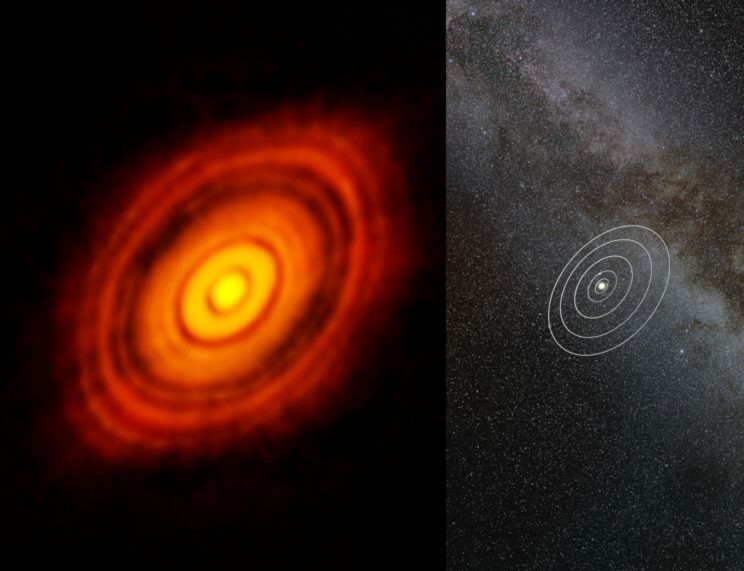 HL Tauri: a young star and forming planetary system seen by the ALMA telescope. On the right is our own solar system at the same scale; the outer planet is Neptune, by ALMA (ESO/NAOJ/NRAO). Used with permission. A new generation of highly sophisticated telescopes will soon come into operation. These instruments will augment and extend those already gathering immense volumes of multidimensional data, turning the flow into torrent. The challenge of discovering new science in a tsunami of complex data is spawning an actively growing area: data science. The problem is akin to finding tiny needles in giant haystacks. Possible solutions include harnessing the eyes and brains of millions of volunteer citizen scientists, the use of advanced data visualisation techniques, and the training of computers to seek out the unexpected. The next telescopes, straining at the limits of what is technically possible, will target key questions: what is the nature of dark matter; what is dark energy; how did the first galaxies form; and are there habitable Earth-like exoplanets? The last question is a tremendously exciting one because it includes the search for biomarkers – evidence of the molecules of prebiotic life in the atmospheres of exoplanets. Will the next generation of telescopes tell us that we are not alone in the Universe? Featured image credit: Stars by Geoff Cottrell. Used with permission. Geoff Cottrell is a Fellow of the Royal Astronomical Society, and visiting scientist at Rutherford Appleton laboratories, and at the Oxford University Astrophysics Department. 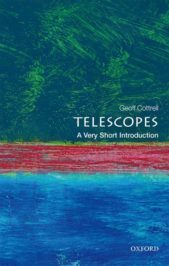 He is the author of Telescopes: A Very Short Introduction.